A few weeks ago, during the conference that Samsung organizes for its developers on an annual basis, the South Korean company presented one of its best innovations . New screen formats created thanks to advances in plastic OLED panels, which have begun to be mass produced to reach consumers next year. These new formats have the objective of avoiding the frown fashion and achieving something unique for the company, and for its customers. The formats that they presented had the denominations: Infinity-U, with a minimum notch, similar to mobile phones like the Essential Phone; Infinity-V, with a similar notch but finished in a V-shape; Infinity-O, which changes the notch by a hole in the screen; and New Infinity, a full screen format, without notch or hole. All of them are really promising, even seen from the competition, but there is one in particular that will have special importance in 2019 . Although Samsung presented the prototype of its flexible screen phone in the same conference, a device that we could have the opportunity to acquire in a few months, the protegonist will be the Galaxy S10. This phone will not have a flexible screen, but it could use the Infinity-O panel design , as shown in a recently published render. With this format, users would not have to support the notch, but it is possible that the remedy is worse than the disease. By eliminating the notch and reducing the frames to the minimum expression, Samsung would be forced to apply a somewhat peculiar design . 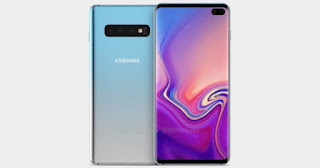 Considering that this new phone would have a double front camera, the hole in the panel would be something more intrusive than it was given to understand in the schemes of Samsung. As for the other specifications, we would have a jump similar to that of other generations in the chipset, but important improvements in the cameras, which will also increase in the back with three sensors. Now we just have to wait to see if the next generation will be able to compete with the iPhone XS. Although the truth is that the bar is not particularly high , so it would be more appropriate to say that we expect Apple to take note of the next Galaxy, if in the end it is worth it.